Just your average hexagon. This one is 3″ on all sides. 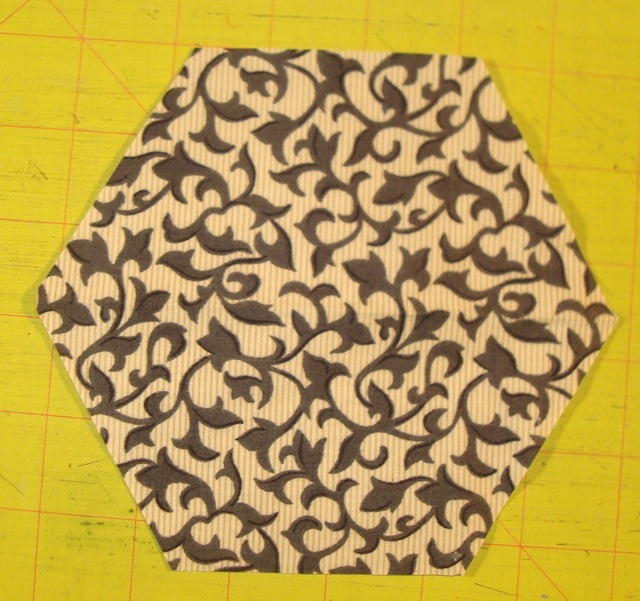 I seem to have lost my quilting mojo for a bit, so instead of showing you the admittedly tragic results of my attempts to work on Big Wheels, I’m going to give you a short “lesson” in cutting hexagons. Hexagons, as you know (maybe!) are 6 sided shapes. 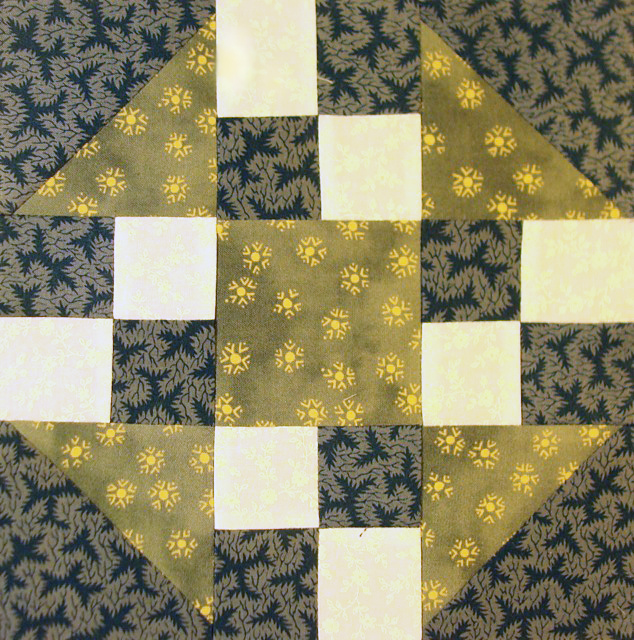 In quilting, we generally use hexagons that have 6 equal sides. 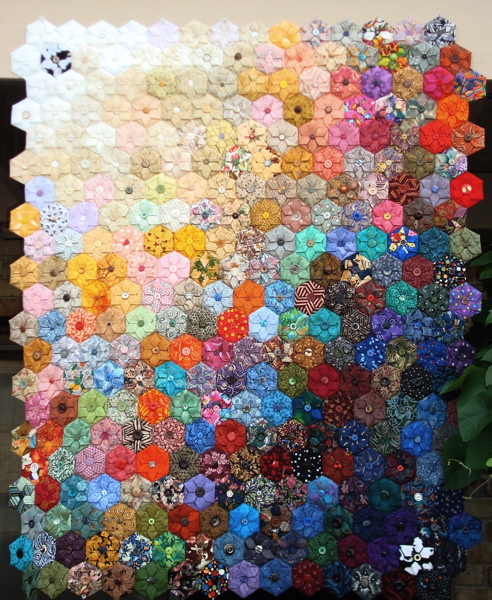 The most common use of hexagons is in a “Grandmother’s Flower Garden” type of quilt. You sew one hexagon to each side of all the hexagons until you end up with a quilt the size you want. Grandma Anna’s Flower Garden uses the Grandmother’s Flower Garden motif, but with folded hexagon flowers. I “got into” hexagons because I became intrigued with Bethany Reynold’s Stack ‘n’ Whack technique which I saw on the much missed TV series “Simply Quilts” with Alex Anderson. 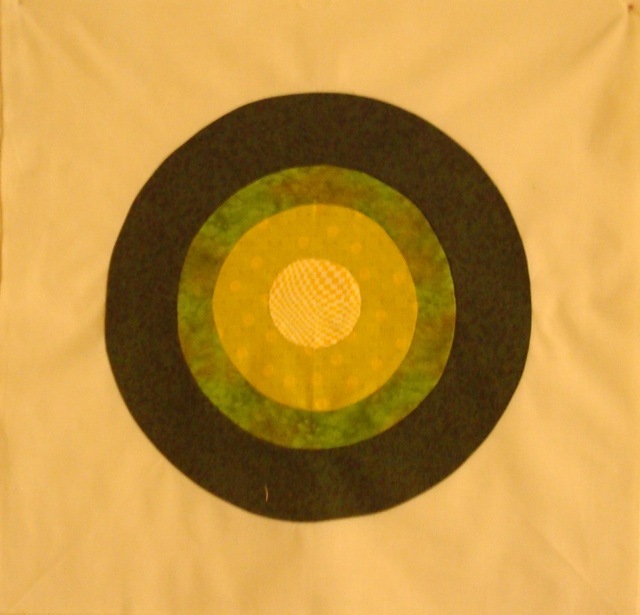 You can see one of the quilts I made up above, under the title of this blog. Then I fell in love with a folding technique in Rebecca Wat’s Fantastic Fabric Folding. It turns out you can use any size hexagons for the hexagon flowers, so rather than tediously draft a template for each size of hexagon I wanted to try, I experimented with cutting out hexagons from a square. Figure 1. Start with a square. 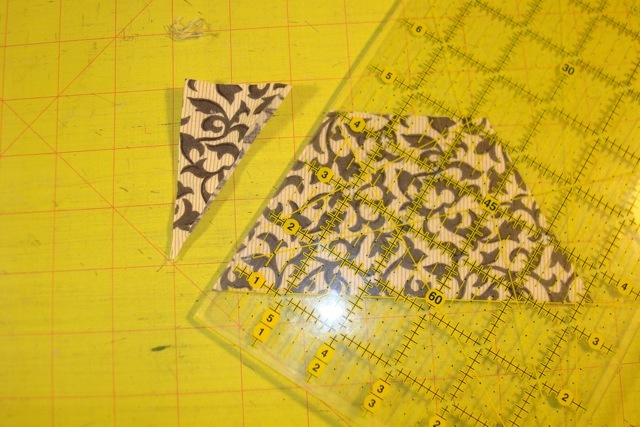 Most people specify their hexagon size by the edge dimension, so you will need to cut a square that is twice that size. 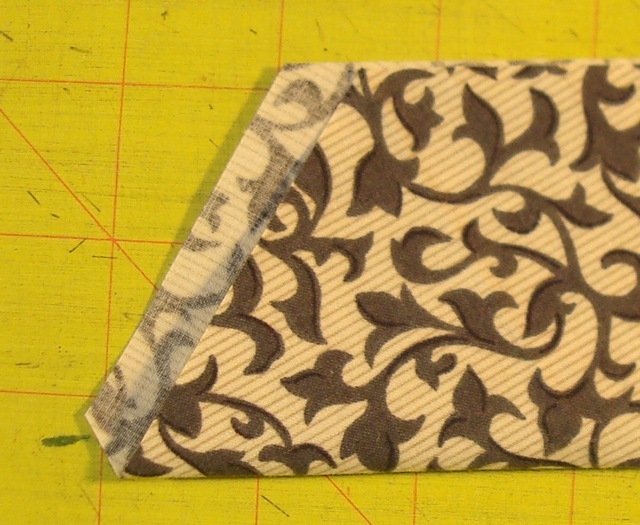 Figure 2: Fold your square in half. 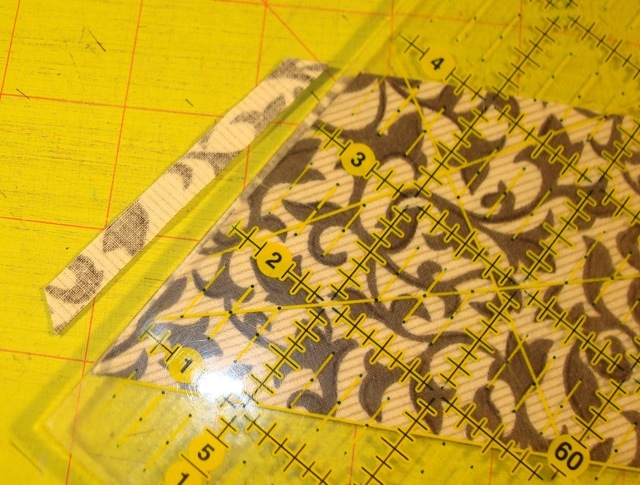 Figure 3: Trim the right corner with a 60 degree angle. 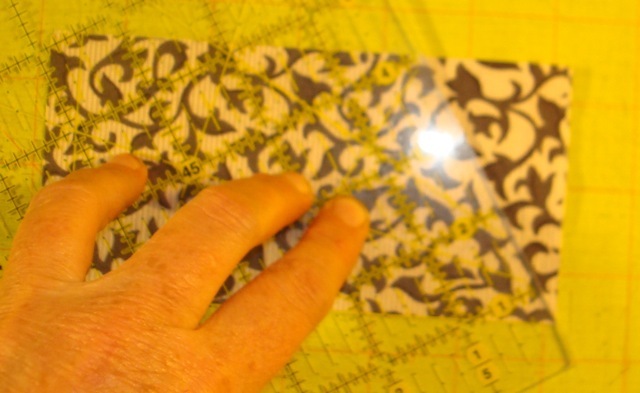 Trim your folded square of either edge using a 60 degree angle. 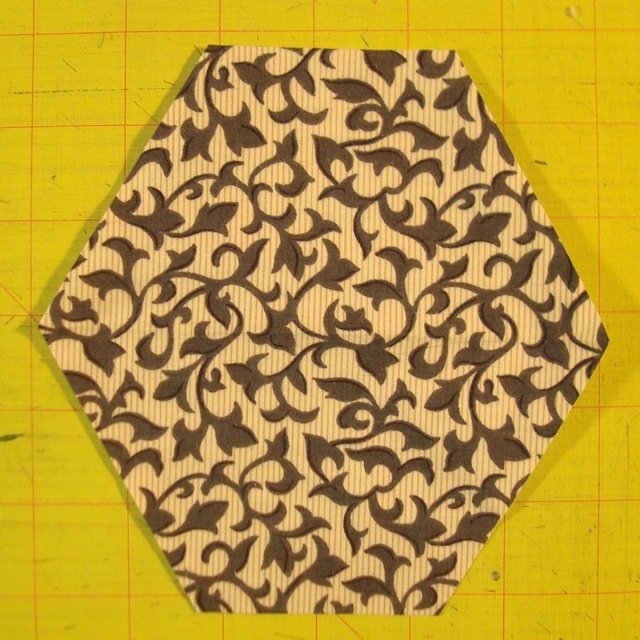 Figure 4: Cut the left corner off of your folded square to form a hexagon. Figure 5: Open your hexagon up and you will see that four of the sides are long and two are shorter. 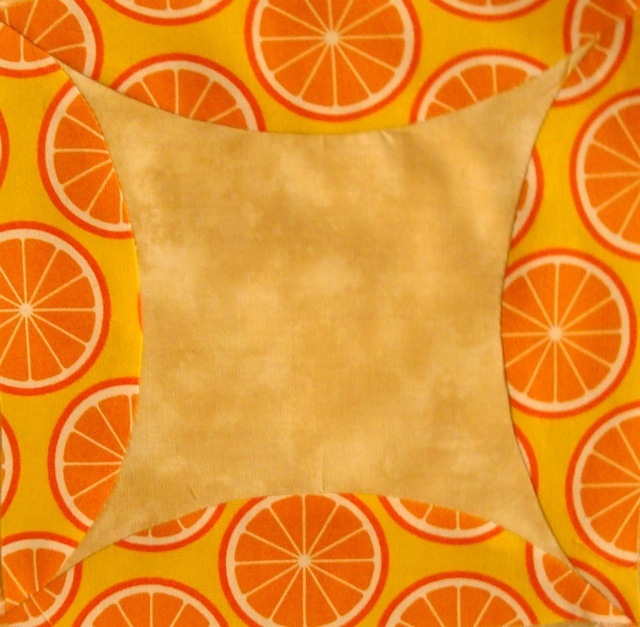 To make the sides of your hexagon all equal, you need to fold your fabric again. Figure 6: Fold your hexagon in half with two of the longer sides even at the top. Trim the hexagon so that the edges are even. Figure 7: Flip your hexagon over and trim the other edge. Now you should have a hexagon with all sides the same measurement! So, I hope this quick tutorial made some sense. If you have any questions, please let me know and I’ll modify it to make it clearer. And, maybe I’ll have something worth showing next week! Block 3 of Big Wheels is done. This means I’m “officially” a quarter of the way done with the blocks. 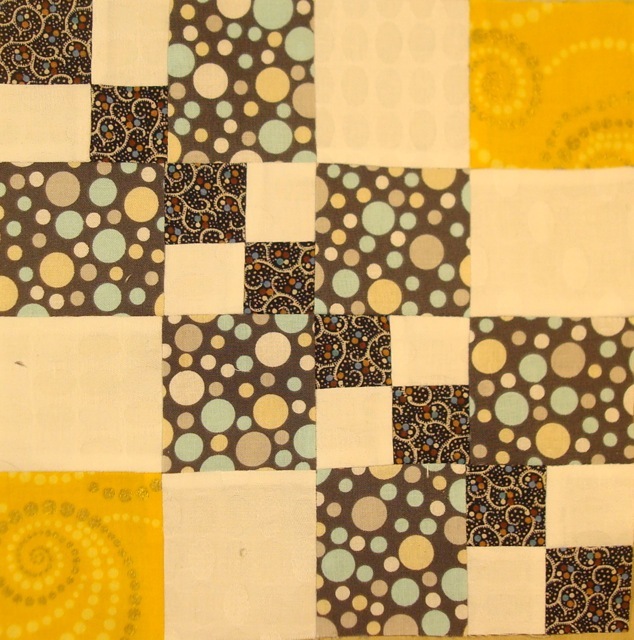 As I mentioned when I posted last weekend, it was a traveling week for me and I really didn’t get much quilting in. It was nice to see Mom again. One of our “very loose agenda” items was to work on a blue and white Triple Irish Chain for my brother. I don’t think I even set foot in Mom’s studio since I was kept busy with phone issues and computer issues and *gasp* actual sleep. Block 24 of Grandmother’s Choice. Are we done yet? When I got back here, Peg had a bit of a health scare. The friend who subs for me as Peg’s PCA is a paramedic and she was alarmed at some symptoms Peg was showing (shallowness of breath, queasiness, etc.) Basically, I had time enough to drop off my luggage and off we went to the doctor’s and then to the hospital for tests. All negative, thank goodness! So all the errands I had expected to run on Thursday afternoon got pushed to Friday. The latest Grandmother’s Choice block. Once again, I’m up to date. Yay! I was able to squeeze some time in to visit my cousins (in town to attend a funeral, unfortunately.) It was nice to see them all again, and meet the kids. I wish it had been under happier circumstances, but after having it hit home just how short life is, I’ll take what I can get. We were supposed to get more snow today and tomorrow, but it looks like that won’t happen (or at least it will only be a couple of inches.) If there is no snow at all, I might take the chance and snap a few pictures of The Quilt That Shall Remain Nameless from the back porch. So, that’s my quick update. I should be able to get back on the Thursday schedule again this week. 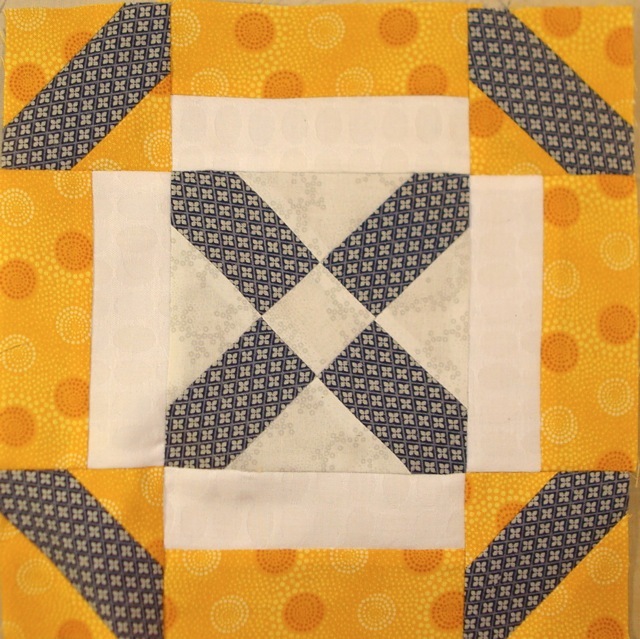 Maybe I’ll dust off one of my “quilts without borders” and see what I can do to get them to the “quiltable” stage. 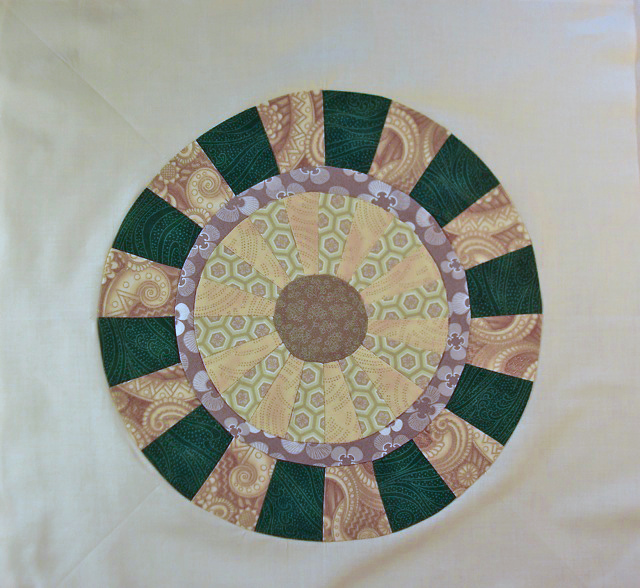 The second block in my Big Wheel quilt I’ve been calling “Bull’s Eye.” but I really don’t know if it has a name. I FINISHED The Quilt That Shall Remain Nameless! Other projects for the last couple of days included winding 10 bobbins, packing for my trip (tomorrow! 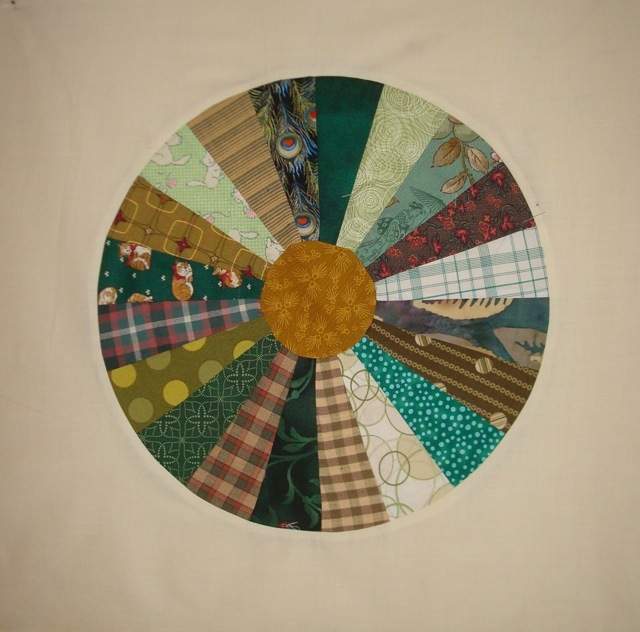 ), and, of course, designing and sewing on the Big Wheels quilt. 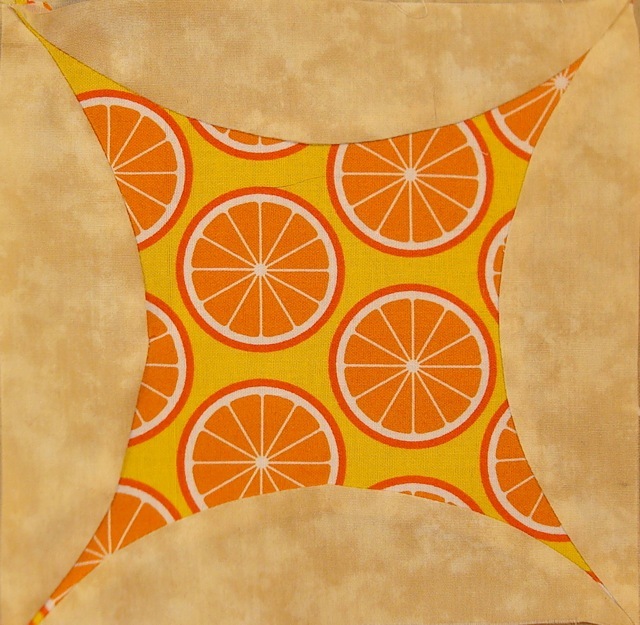 My second Orange Peel block is an improvement on my first! The arc on the sides of the Orange Peel block is part of a large circle. 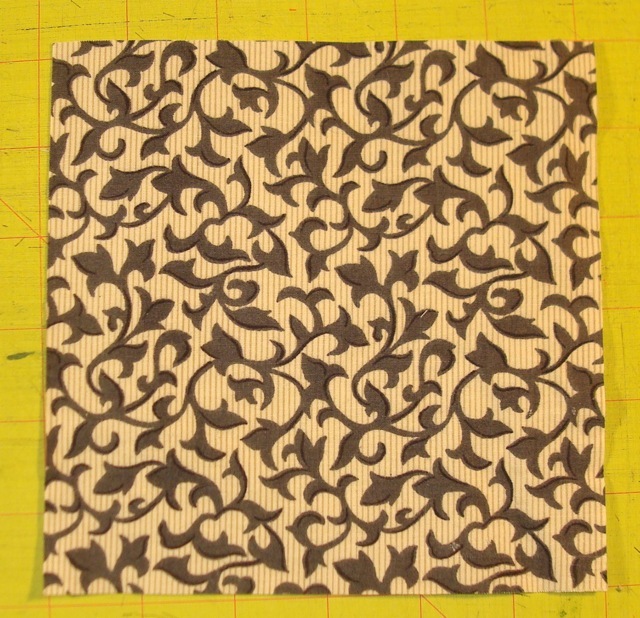 I’ve been cutting them out using my Cut Around Tool, which makes it really easy to do. Pressing the side pieces towards the side enables you to see the edge you will be sewing the adjacent side pieces to, so you can you can get the corners tight and pointy. I’m sure that illustrations would make this clearer, but I hope the photo helps a little. As I think I mentioned, I’ll be traveling this week, so I may not get a post up on Thursday. I’m making a tiny bit of progress with The Quilt That Shall Remain Nameless. 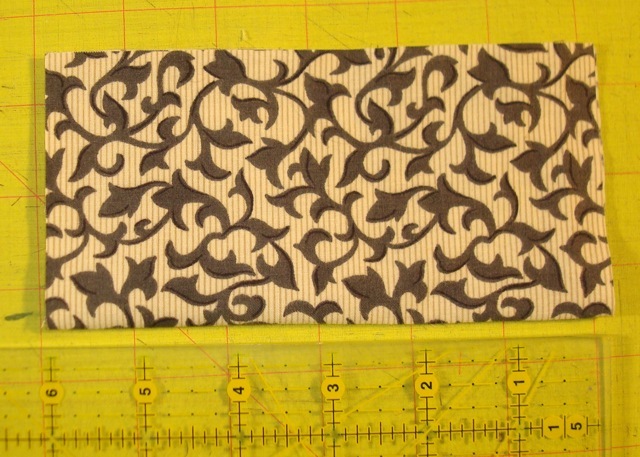 I am almost finished piecing the last two pieced borders (there are four borders left, two pieced and two plain.) Will I get this done by the February 10th due date? It’s looking more hopeful now. The rest of the day I will be drafting my next Big Wheel block…unless I decide to the Dresden Plate, in which case I have templates already. Oh and tomorrow is fabric shopping with Valerie at the Fabric Place… WITH a coupon. Does it get any better?